Discover the city at your own pace! You can never think enough about the hop-on hop-off bus tour to discover a city! It is however an extraordinary and economic way to make a first connection with its main tourist attractions, without stress, at its own pace. Barcelona bus tour offers three routes where no monument is forgotten. A great thing to do in Barcelona! How does bus tour Barcelona hop on hop off work? The open bus runs through the city on predefined routes. These routes stop in front of each significant monument in the city. Your ticket allows you to hop on and hop off as many times as you wish throughout the day or for two days depending on the fare you have chosen. 100% mobile and skip the line: If you buy your ticket on our website, it will be mobile, i.e. either printable, to keep on your phone and present to the bus driver. No more waiting lines to get your ticket at a tourist office in the city! You receive your ticket by email immediately after purchase. Your ticket is valid all year round, it will only be activated when it is scanned on the bus. From then on it will be valid for the whole day or for two consecutive days according to your purchase. Free audio guide with headphones : The audio guide included in the ticket price is currently available in 16 different languages (English, Catalan, Spanish, French, German, Portuguese, Chinese, Japanese, Italian, Russian, Norwegian, Swedish, Turkish, Dutch). A city map is available on board. Enjoy the presence of an official tour guide on board the bus, he will answer all your questions. Finally, thanks to the open top floor of the double decker, take all the pictures you want of this extraordinary city! Your ticket allows you to choose between three bus routes and offers you 45 possible stops. You do exactly what you want. Jump from one line to another - there are 5 crossings where you can change lines - make your ideal route or let yourself be guided. 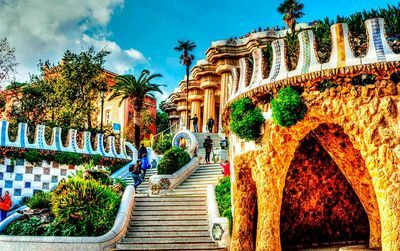 The blue route takes you to the most important places of Modernisme such as Casa Batlló, Casa Milà - la Pedrera, Casa Amatller, Casa Calvet, Sagrada Familia, Parc Güell, Tibidabo, Camp Nou FC Barcelona stadium and finally Macba. The red route stops in front of the Tapiès Foundation, the Casa Batlló, the Casa Milà - la Pedrera, Casa Amatller but also the Spanish square, the Mies Van de Rohe Pavilion, the Poble Espanyol, the Mnac, the Joan Miro Foundation, the port and the Olympic port and the Gothic quarter. The green route takes you along the coast on the Ronda Littoral. It's up to you to make the stops that suit you. Barcelona city tour bus route map: To prepare your route find here is the map of the 3 routes and stops. Buses run every day between 9am and 8pm (7pm in Winter) and run every 5 to 25 minutes. The total duration of the routes is about 2 hours, 40 minutes for the green route for example. The Barcelona hop-on hop-off bus tour, is a great way to catch Barcelona in a few hours. You can see and learn, with the audioguides, essential information on all the important places and monuments of the city. Depending on your preferences, you can either stop to visit or tell yourself that you will have to return to this or that place. It is at the same time, a spotting and a discovery of the city. We love being out in the open-bus to experience the city even closer and take pictures. We like the rapidity to go from one attraction to another without wasting time looking for orientation. For children as for adults it is quite fun and finally frankly practical. We can only recommend this experience. In 2019 we enhance your experience! Visit more for less! 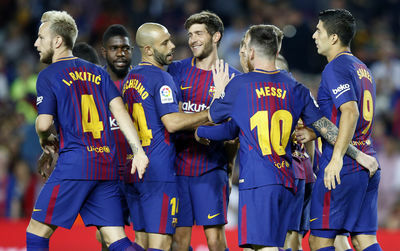 Barcelona.com now offers you combined tickets offering both the Barcelona bus and skip the line tickets to visit most known attractions. It could hardly be easier to discover the city. 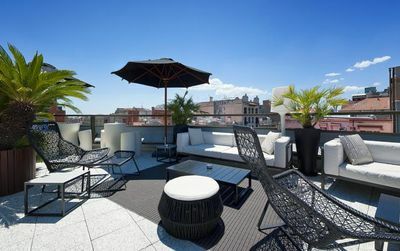 Barcelona.com City Pass - This is the best bargain of the moment to visit Barcelona and it counts! It includes visits to the Sagrada Familia, to the Guell Park but also the hop-on hop-off bus for one or two days, your ticket to and from the city centre to the airport and 20% off for many other monuments and museums of the city. Think about your visit dates and hours before you buy it because it will be requested. Find on this page all guided tours and entrance tickets. You are right, there was an error. Prices are now corrected and valid for 2019. What to do in Barcelona in 1, 2, 3 or 4 days? Visiting the Sagrada Familia: where to eat before or after? You can get on at any of the 45 stops of the tourist bus. Once scanned, the ticket is valid for one or two days according to your package. Hello, once the tickets are booked, the departure must be from a specific place or not? We will help you immediately. No you can't, tickets are for two consecutives days and start when you use it for the first time. We purchased hop on hop off tickets hours ago and the money has been taken but we have not been emailed tickets. The email address was correct and the phone number is not connecting. Please advise??? Can I use my ticket at the beginning of my stay of one week then the 2nd day at the end of the stay? There is a link to download the Barcelona hop on hop on routes PDF on this page. Your senior price for 2 days should be 29 Euro going by the Adult ticket price. 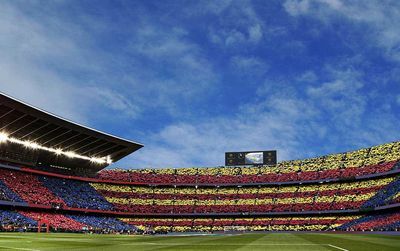 We are looking at doing a special promotion about Barcelona and would love to do this trip as part of it. Where can I find the PDF file of the routes ? Weather was not wonderful but this bus tour was great. I love Barcelona, an incredible city! I always visit with the hop-on hop-off bus. It's the shortest way to understand a city. For Barcelona it's just indispensable.